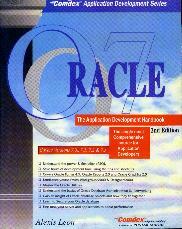 In this second edition, the book has been totally revised and revamped to include the new and powerful features of Oracle 7.3. The newest upgrade of Oracle, Oracle 7.3 exploits the power of parallel platforms for processing sets of records, a common requirement in relational databases. On shared-memory, symmetric multi-processors or massively parallel platforms, Oracle greatly speeds creating and querying large databases by decomposing bulk data operation and executing them in parallel on multiple CPUs. With open systems and parallel technology, Oracle Corporation is lowering the cost of decision support applications, just as it has for transaction processing applications. As with the first edition, this edition also explains the relational database concepts from the very beginning and takes you step by step through the application development-using Oracle. It also introduces you to the latest tools available which will make the application development easy. It also addresses the advanced topics like performance tuning, database administration, etc. So this book is for the end user and the database administrator, for the novice and the experts. Traditionally, the purpose of using these oracles was not so much to foretell the future, as it was to enable the user to delve deeper into his own intuition when dealing with a problem. Probably the most famous source of ambiguous pronouncements was the oracle at Delphi in the ancient world. One of the Oracle's best known prophecies came in the year 480 BC The Persians under Xerses had invaded the Greek mainland and had successfully conquered two-thirds of the country. Naturally, the Athenian city-fathers were concerned as to which course of action they should take against the oncoming Persians. They realized, however, that before any decision could be made they should send some suppliants to Delphi to get a reading from the oracle. The suppliants made the journey and received the following prophecy: "The wooden wall will save you and your children" . The suppliants took these words back to Athens. At first the city-fathers were unsure what the prophecy meant. Then one person suggested building a wooden wall up to Acropolis and take a defensive stand behind it. But the city-fathers knew that the oracle was intentionally ambiguous to force them to go beyond the first right answer. They tried to think of all of the contexts - both literal and metaphorical - in which the words 'the wooden wall will save you and your children' would make some sense. After some thought, they came up with another idea. Could the wooden wall to which the oracle was referring be the result of all of the Athenian wooden-hulled ships lined up next to one another? From a distance, the ships would indeed look like a wooden wall. The city-fathers decided, therefore, that the battle should be a naval one rather than a land one. In 479 BC, the Athenians went on to rout the Persians in the battle of Salamis. The Oracle's ambiguity forced the Athenians to consult the deeper wisdom of their own intuition, and consider alternatives.